Starting the conversation are Lon LaClaire, Manager of Strategic Transportation Planning for the City of Vancouver, Brian Mills, TransLink’s Director of Service and Infrastructure Planning and Simon Jay of the Vancouver Public Space Network. Lon LaClaire talked about the Transport 2040 plan and its targets, which will require a reallocation of road space from cars to walking, cycling and transit. Transit trips have to double (or is that the share of the market has to double?) to reach goal. In the process of revising the City’s plan the importance of the public realm emerged from the discussion about improving the economy. It was noticeable, I thought, in his illustrations that the population of the West End has not changed nearly as much as the growth in Yaletown, Gastown and SE False Creek. He stressed that the current review of downtown transit was not just about the #5 but better service to these newly grown areas. Bus routes 5/6 are pretty much the same as the original streetcar routes. The 3,200 value Brian Mills mentioned actually refers to the number of riders travelling through the 800 Block Robson on the #5 on a daily basis in each direction. The total boardings on the #5 are closer to 10,000/day on weekdays, as indicated in this pdf file 2012_BSPR_Route_5 from the 2013 Bus Service Performance Review. Rerouting the #5 had caused confusion and introduced delays and difficulties for users. He saw that the future of the route was an opportunity not a threat. It was possible in many places for transit and pedestrians to share the same space while closing the street to other vehicles. The majority of speakers wanted to voice their displeasure about the reroute which had imposed delay and inconvenience. they stressed that only people with limited mobility, who have difficulty coping with the gradients of the streets involved and the necessity of being close to their destination when they got off the bus could appreciate how bad the situation had been. They pointed out that the VSPN illustrations of what a shared space would look like had no seniors illustrated in them. I regret that I was sitting behind Voony when he raised three points which I could not hear. He has added them in the comments section with some additional commentary. I have copied and pasted them here. the Robson-Denman-Davie transit has been here since 1890~, when the west-end was pretty much still a forest, and has been resilient to all changes: people organized their life around it. In fact it IS the motor of the change, and still is, see for example the latest West End Community Plan organized around the “West End” loop: Robson-Denman-Davie recognized as the “lifeline” of the West End. There has been much more change around the downtown buses in their first 100 years, than in the last 20. 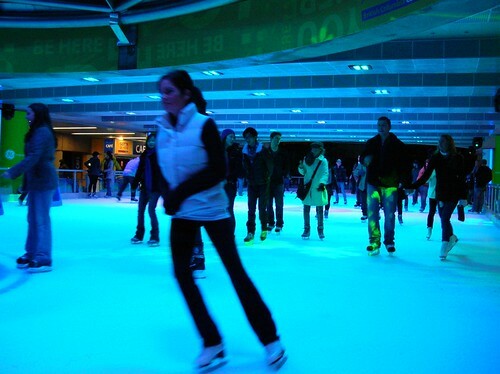 It was pointed out that it ought to be possible to reconfigure the public realm around Robson Square and to make increased use of both the plaza on Georgia Street as well as the lower level “down where the skating rink is”. One older lady stated: “The number of times I need to visit Victoria’s Secret is very limited” . She has taken pictures of the 800 block during its closure and seldom has seen more than 30 people at a time there. There was one senior, male, from the West End who pointed out to his peers that the concerns should also address matters pertinent to their children and grandchildren. I put my hand up, of course. I felt I should stress that the meeting was not part of Translink’s route consultation, nor were any decisions imminent. I also pointed out that the detour of the #5 was actually determined by the trolley overhead. Someone else noted the absence of a just one switch which could have made a huge difference. I noted that Translink has electric hybrid buses as well as trolleybuses, but no-one seemed to have considered putting poles on them. It is not impossible to have a duo mode bus which could switch between wires and its own power without the operator leaving the driving seat. I also said that other cities have transit running through pedestrian areas. Given that the service frequency of the #5 is 7 minutes at best, it should not be difficult to come up with a design that allows for buses in a public realm. It is also the case that everywhere else seems to manage to have pedestrian only streets as well as bus only lanes. Only Vancouver seems incapable of organizing these. Gil Penalosa’s talks show how 8 year olds were able to design public spaces where cars, pedestrians, buses and cycles all had their own space. Can’t we? You can now see the results of the Translink’s work on redesign of the bus routes in Downtown and comment on them. I had assumed there was a substantial reason for the long detour from eastbound Robson to northbound Burrard via Thurlow. I didn’t realize it was caused by the lack of a left turn in the trolley wires from Robson to Burrard. Thanks. The 5 has 3.35 million annual boardings, which works out to 4600 people/day, carried on 161 buses in each direction. If the detour takes five minutes, it wastes 27,000 person-hours each summer and, if it costs $110/hour to run a bus, it costs Translink $100,000 each summer. Does it cost this much to put up a switch and a trolley left turn? My thinking on the downtown bus service review is in the linked pdf. Substitute Granville for Seymour/Howe if you are comfortable with diesel artics on Granville and want to end regular evening and summer closures. So it has been much more change around the downtown buses in their first 100 years, than in the last 20. I have also found disappointing that the translink representative chose a diesel bus to illustrate the 5..
A share space work much better with an electric bus than a diesel: noise consideration, trolley wire, marking the path of the bus…so it is important to get this level of detail right. I also think it has said, that the #5 has ~9000 boarding, 6400 (or 3,200per direction), crossing Robson square. It seems so basic that the #5 should stay on Robson the whole way I just don’t understand the problem. 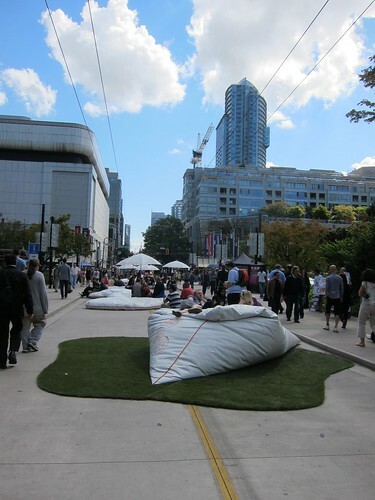 I have never understood the point of closing one measly block of Robson. 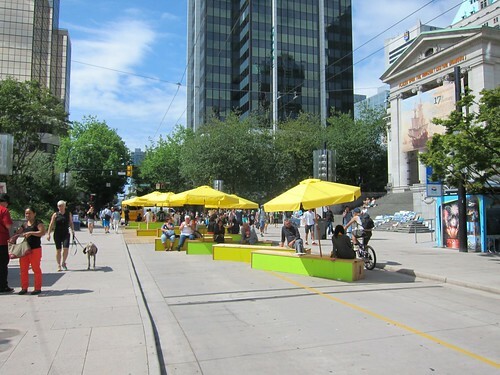 Closing a whole street (Robson) makes sense—it has been done in thousands of cities– but not just that block, especially when it hamper buses. Is it making the street pedestrian + transit only (like Cours de l’independance in Bordeaux, and many other EUropean example), or getting rid of the transit altogether? The problem with keeping the 5 on Robson all the way is that it is 350 m from Dunsmuir – too far to walk for many – and going all the way to Beatty will take more than 5 minutes longer (assuming 10 km/h) than turning at Burrard. There are 9 intersections in 900 m from Burrard to Beatty, so it will probably remain slow. The difference between now and 1975 is rapid transit. We no longer have to accommodate suburban buses, but we do need to make fast connections to rapid transit. On Robson, I think the faster connection to the Expo Line at Burrard (or even Granville) is more important than a straight route. On Davie, there is a choice of a fast connection to either the Canada Line or Expo Line, so I think the straighter route should be chosen. The ridership numbers and bus count I used are from the 2012 performance review. A problem with this approach is that transfers between these two lines are horrific, so it is not unimportant which one is chosen. If you just had to go up an escalator/elevator to transfer at Granville/Dunsmuir/Georgia stations, the choice would be more straightforward. But we don’t have that because $$$. 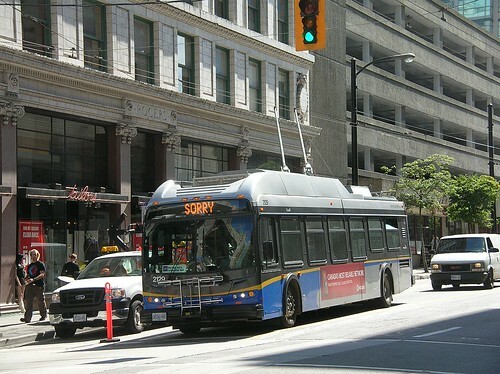 If the 5 must go on Robson, one solution would be to implement a bi-directional bus-only lane on 800 block robson. Because the 5 bus has a max frequency of 5min, the waiting caused by taking turns to share the lane won’t be much. This way, more space can be reserved for people. If the traffic lights at hornby and howe on robson are synchronized for this scheme, using a bidirectional lane can be a very effective solution. If the Davie bus connects to the Canada Line at Yaletown, it should also connect to the Expo Line at Stadium. Similarly, if the Pacific/Beach bus connects to the Canada Line at Yaletown, it should also connect to the the Expo Line at Main (and Stadium if you’re willing to walk further). Trips between Davie and the Expo Line should not depend on the Canada Line. The long transfers between the Expo Line and Canada Line will be a very small problem after the Millennium Line is extended. People heading to Main or Stadium from the Canada Line will still make this transfer (or they can take the bus from Yaletown! ), but everyone else will be able to avoid it and save time doing so.